More Info: this document explains some of the features listed above. Please Note: We can only ship Held products to addresses in the 50 US states, US Territories and any APO/FPO addresses (per manufacturer’s restrictions). These gloves, like virtually all other Held gloves I’ve tried on, fit very consistently from one model to the next. Hopefully you have some experience with Held gloves, but if not, the conversion chart and size chart should work for you. 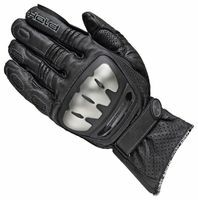 The SR-X glove from Held is their new “ultimate” short cuff glove. If you like the protective features you find in top-of-the-line race gloves, but just don’t like the big long gauntlet, then you’ve found your glove. Firstly, these gloves are made of Kangaroo, which is well known and regarded for its usefulness in making gloves. Even thin cut hides, which are ideal for gloves when “feel” for the controls is important, are very abrasion resistant and will out-perform cowhide. Many top end race glove are made of Kangaroo, or at least the palms are. With this glove, the whole thing is Kangaroo. The palm leather has micro perforations which will make these gloves a bit more comfortable in hot weather too. And like race gloves, these have reinforcements for abrasion and impact. As you can see, the knuckle is covered with a plastic/metal knuckle guard which is very robust. But under that knuckle guard is a layer of pliable foam to fit your hands just right when you make a fist. At the heel of the hand there is a highly abrasive and “slick” type fabric which will promote sliding (much like plastic sliders in the palms). And finally, on the outsides of each wrist there is a large panel of dense impact foam. LOTS of hand protection here. The glove is secured to your wrist with a Velcro close strap.